Why Canterbury – Why Christchurch? The first public railway to open in New Zealand was between Ferrymead and the newly settled town of Christchurch on the 1st of December 1863. The area at Ferrymead that this railway occupied is now largely a Heritage Museum, with an operational railway, rebuilt on much of the old original track foundation. What better place to position a museum dedicated to the saving of railway history, and displaying it for all who wish to visit? The Canterbury Railway Society has what is generally considered to be the finest collection of railway equipment, artifacts, and records in the country, and much of this will be transferred on permanent loan to the National Railway Museum. 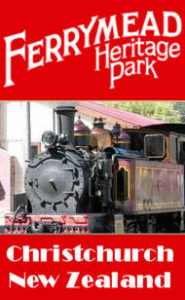 The Canterbury Railway Society will continue to operate the Ferrymead Railway as part of the Ferrymead Heritage Park. The National Railway Museum concept is supported by the Federation of Rail Organisations of New Zealand, the N.Z. Railway & Locomotive Society, the Rail Heritage Trust of New Zealand, and numerous other local bodies, corporate organisations, and individuals. The museum in itself will provide an important additional tourist attraction for Christchurch, and be a ‘mecca’ for rail enthusiasts from all parts of the world. The original Ferrymead Railway opened in 1863, the Canterbury Railway Society started on the ‘new’ Ferrymead Railway in 1965, it is our ambition to open the National Railway Museum of New Zealand, in Christchurch by the end of 2018. What can you expect to see in the Museum? Railways are locomotives, wagons, & carriages, but they are also a lot of other things, like cranes, bridges, stations, signals, maintenance and lineside equipment. The museum will contain examples of steam, diesel, and electric locomotives from many eras. Passenger carriages from the 1870’s to more recent times, together with two very special carriages, a Vice Regal carriage used for the visit of the Duke of Gloucester in 1934, and also for the later visit of Queen Elizabeth II and the Duke of Edinburgh in 1953-4, together with a second carriage built in 1927 for the visit of the Duke & Duchess of York in that year. Freight carrying vehicles are many and varied, with special wagons for sheep, cattle, horses and bulk handling vehicles for logs, coal, and petroleum. Not to be forgotten are the smaller day to day items like crockery, tickets and very distinctive railway uniforms. The list has no end. Of use to historians will be the vast collection of blueprints, photographs & equipment, and operational files. These will be housed in a purpose built building that will have special humidity and temperature controls for the preservation of these very old documents. All old stations had a variety of functional objects, water towers, signal boxes, platforms, sheds, all of different shapes in a happy jumble. All this grew naturally and continually in the life of the station era. This is the kind of architectural character you see when you look across at the museum from the existing station, the platform with a replica of Pilgrim (the earliest locomotive to haul a passenger train in NZ) on display with her carriage, a verandah and café and shop. Next are the main entry doors with a sloping glass roof foyer rising to the upper display areas and offices. This entry foyer has stairs and a lift. To the right will be a modest two story building housing a display on the lower floor, and then on the upper level, the management areas. Beyond the glass roofed foyer at the top of the stairs is the upper display area opening onto the full view down to the Roundhouse. To the left are the really important archives, seperate in a fireproof double level space. The roundhouse is an impressive space rising to 12 meters at the central glassed dome. Below this dome is the NZR restored turntable with up to 28 display tracks, displaying a range of locomotives and rolling stock, with the total diameter of the Roundhouse at 70 meters.